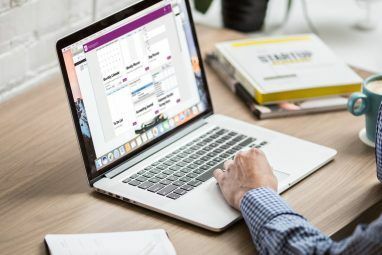 It’s easy to understand why there are tons of online and software notebooks out there to choose from: mainly because there is so much information to manage, bookmark, and share in our online and mobile file cabinets. Clearly Evernote serves this purpose as a cross-platform notebook. It is supported by hundreds of other Internet services, mobile apps, and tools. But no matter how many times I’ve started using Evernote, I’ve never been totally happy with it. For me, it lacks the visual orientation that I find appealing in Pinterest, and now Springpad. In my view, Web 2.0 has also been about the rise of the visual and the fall of the word. I don’t mean the disappearance of text; I mean that in the internet world, images drive content. This is one reason why Pinterest became so popular. Well, in many ways Springpad includes the best of both Evernote and Pinterest, and it’s why I may be turning to it as my notebook of choice. We covered Springpad back in 2008 when it was first released, but since then it has been redesigned with some significant new features. Now admittedly, I just started using Springpad, but just as I like to use the visual layout of Pinterest to catalogue all the products, recipes, and apps I like; I think I’ll become more inclined to use Springpad in the same fashion, but as a notebook for projects, notes, and text clippings. Springpad includes a few viewing options for both the size of notebook icons, and their background color. These features provide visual variety and context which makes the notebooks layout more appealing. And like Pinterest, your Springpad notebooks can be privatized, shared, tagged, and categorized. However, though I currently have only a handful of notebooks, I can already see that it would be useful if there were an option to organize notebooks alphabetically. Like Evernote, Springpad does have a web browser clipping tool to quickly bookmark URLs and copy selected text to a notebook. Springpad’s Smart Notebook feature allows you add just about any note or file to your Springpad as you can with Evernote. But Springpad has a few unique features that you might find useful. For one, you can perform web searches from within your account, so that selected results can be added directly to one or more of your notebooks. Springpad also includes other types of note formats for creating a checklist or task, adding a contact, setting a calendar appointment or alarm, and adding just a plain note, photo, or even video file. To use these features, click on the type of note you want to add, type a title, and hit the return key. A text box or form will open so that you can add, tag and save the content to one of your notebooks. There’s also the ubiquitous social network sharing feature as well for your notes. Springpad includes a smart search feature. In the Quick Add drop down panel, if you select Book, Music, Product, Recipe, TV Show, Wine or Place, Springpad will narrow the search results based on your selection. One issue I have with the search feature, however, is that you can add only one item at a time. After you add an item, you must type and run the search term again. So this feature is definitely for quick, not advance, search results. Also, you can’t add plain text notes from your menu bar, as you can with Evernote. You have to open your Springpad account in the web browser to add a note. 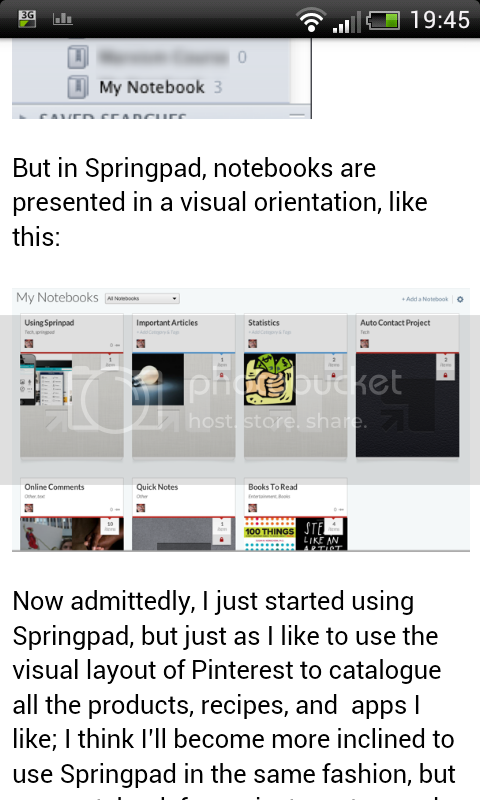 Though notebooks can be shared in Evernote, Springpad is again similar to Pinterest in that you can subscribe to the notebooks and clippings (“Springs”) of other Springpad users. Springpad’s Explore page introduces you to a fairly wide category of topics including Entertainment, Design, Tech, Home and Living, Business, Education, News, etc. You can also explore by tags. When you follow a notebook, the contents of clippings and notes will show up on “Following” page. From there, you can browse and add selections to your own notebooks. This feature is very useful for collaborating on projects or simply taking advantage of the content other users have publicly added. 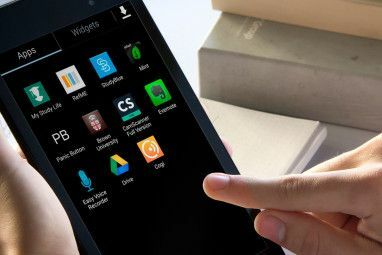 Springpad of course does have apps for iOS devices and Android, and the features I describe above are also included in the mobile app versions. I found that content added to my account syncs and updates between devices very quickly, and the UI is so smiliar that I know where to expect to find features and buttons. The mobile app also includes a browser plug-in so you can add clippings as you browse the net outside of the Springpad app. While there are no “Spring it” buttons on popular web sites, the visual orientation and user interface of Springpad is a major attraction for me, and that alone will probably cause me to use the notebook service more in my day-to-day workflow. Let us know what you think of Springpad. Have you given it a try? What features would like to see added? Hidegerd, I agree. And it seems that they were just getting off the ground with some new features, and then all of sudden, they were closing down. It was a shock to a lot of users. It was a really well designed site, but I guess they didn't monetize it early enough. Sam, Springboard is no doubt reading these comments and is probably put that feature on their list. Thanks for the feedback. Hey Ken, thanks for the feedback. Sometimes it's a big tossup between Springpad and Evernote. I ended up using both. Hi, great article. I just started using Springpad after years of using Evernote and I love the visual aspect of it. Picture's worth a thousand words, as they say. Speaking of which, how did you customize your notebook covers to display the title on the top and large images underneath? I've been looking for a setting for this, to no avail. I think both are great, Evernote has more supporting apps, more futures and the standalone application that make it more integrated, but Springpad has its own beauty. @Bakari - This is a really great comparison of both services. 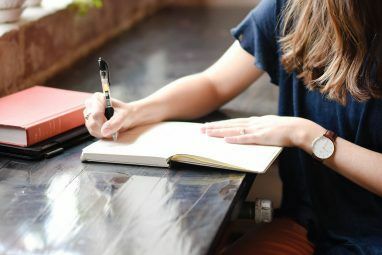 As the author of the Official Springpad productivity eBooks and the Unofficial Evernote GTD eBook, I can tell you that you've hit the nail on the head here! Great job!! Thanks for Daniel for your feedback. You've no doubt seen the latest Beta version of Evernote. It now has a more visual orientation. I still prefer Springpad for my needs, but Evernote seems to have a lot more support with other apps and services. I currently use Note Everything and am considering a switch to Springpad. What I like about Note Everything is the sync with Google account - calendar, email, alarms... will Springpad do similar? I love both products and it's quite clear why Daniel has chosen these 2 for his eBooks and why you Bakari are comparing them. 2. Tags are still a mess - sorted only by popularity, and showing only a limited list on mobile. 3. Batch editing in several areas of the service/app is sometimes a trouble or just not possible. I agree. I've been an avid springpad users for over a year now, but I continue to face numerous nagging usability issues which make me wonder if there are better options available. Brittany, thanks for your feedback. I think many users of both services would agree with you. I have been bouncing between Evernote, Springpad, and Catch. I like that Evernote has a desktop app for windows so that I can drag and drop photos. Here is my problem: I take photos with an iPhone and the geotag info is important. If I do not take them WITHIN the app, I lose the geotag info. It must be entered manually if I ATTACH the photo file later. I am not even sure if Springpad shows geotag info / location as Evernote and Catch do. Evernote allows you to "view on a map." Is there a way to move all my Evernote content to Springpad at once? I am not sure whether this is possible, but if you post a question on MakeUseOf Answers, you will definitely find out in case it is possible. Yes, this is possible. Search the springpad blog for a handy script for doing this. Thanks John! I will give it a try as soon as I get around to loading the desktop version of Evernote. completely agree. I think of springpad as evernote + pinterest + zootool. I like visual bookmarking, storing images and webpages with tags and finding new sites and work from other people with similar interests. I like that springpad stores the images, so if the original site goes offline I still have a copy. ultimately evernote's monthly limit was annoying and the dull interface made me say bye, but I hope these two remain competitive and push each other to make better products. Ryan, thanks for the feedback. I didn't realize Springpad stored the images online. Very good to know. I agree that Evernote's monthly upload limit is annoying. That said, I know they're a business and can't make money off free users. What I mean by annoying is a psychological thing - you don't want to go over limit so you become very careful about what you clip or upload, and that anxiety is something I can do without! Quite sad though as I was enjoying using the Evernote Food app to record my meals until I realised that the photos were pushing me over limit. Photos are a no-no for free users as they eat up so much space. So I'll stick too Evernote for web clippings and move to Springpad to store photos of important documents - thanks for letting us know that Springpad has OCR too, Bakari, as that's crucial for my document storage purposes! And thanks, Springpad! I've used springpad for a while now and find it very useful.. Great app and great visuals.. Thanks for the feedback, Darren. Appreciate it. Nice article explaining the benefits of Springpad. I've been a Springpad fan for a long time. I tried Evernote but I went right back, in part because Evernote requires a premium subscription for some of the features that Springpad offers for free. The most important feature you don't get for free with Evernote is offline access to your notes. I love the security of knowing I have access to all my information regardless of where I am. Hey, Paul, thanks a lot for pointing that out. That's a good feature to know about. for me i love springpads look, but as far as using it to replace evernote no chance, as i use the web clipper alot to copy text and pictures to view later on my android phone, springpad display of this content is awful, pictures not displayed and all the text shifted to the right hand side I have tried lots of different ways to clip the infomation i want with springpad but nothing seems to work, always the same outcome, but with evernote the page is displayed perfectly just as i see it on the pc. Todd, thanks for sharing this. Maybe Alison over at Springpad can address this issue. I haven't used Springpad on android, so I'm not aware of that problem. But yeah, thanks for your feedback. Good point, juanDM4. I still haven't checked out Onenote yet. Keep reading about it. I don't understand why your Evernote notebook list appear that way. Mine appears neat (I can't send a screenshot since I don't want to expose my files). Springpad graphics are sure better than Evernote's but I dumped Springpad because it suddenly gets off the screen without saving precious notes. Pochp, the note entries in Evernote can be displayed as image icons, but not the notebooks, at least not in the desktop client. That might be different for mobile Evernote clients. They both have strong features, so it's really what works best for you. You're welcome, Alison. Since I wrote the article, I've doubled the amount of content in my Springpad account. I'm looking forward to more features in the months and years to come. Thanks, appreciate the feedback and your readership. I had to closed my Evernote account, so I can open my Springpad account. Why did you have to close your Evernote account in order to open Springpad? You should be able to run both at the same time. 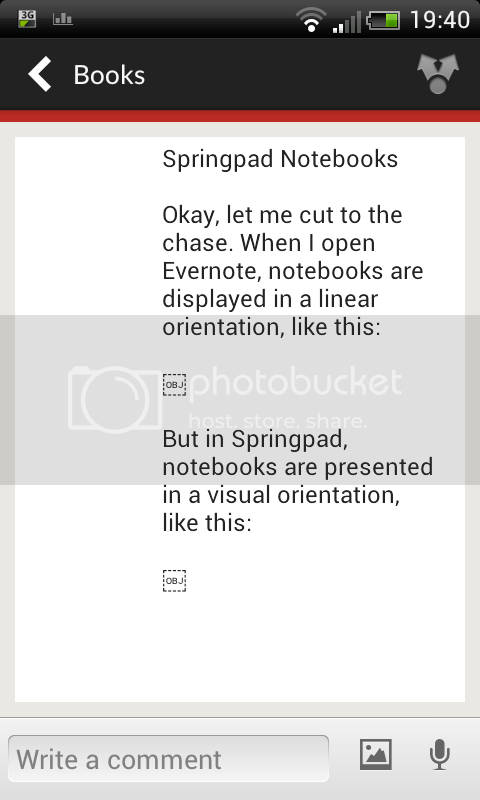 I love both evernote and springpad, but it would be great if Springpad had a webclipper feature and supported OCR. Yep, and they work nicely. Oooh I was all over them for the new social look, without addressing low Res images (taking a snapshot of a recipe, say, was useless) ....but now everything works great! I looove spring pad! I want to send them a box of cookies! I'm sure they will be happy to read your comment. Thanks for the feedback. Yeah, there's a lot to like about both, but I just prefer the more visual orientation of Springpad, though Evernote clearly has more supporting apps.